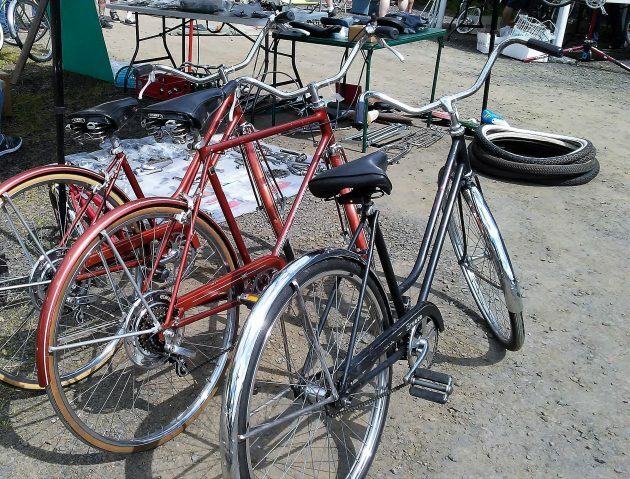 Used bikes, like these at an Albany swap meet, would be exempt from the excise tax. House Bill 2017, the road transportation bill concocted by a committee of the legislature, would hit buyers of new bikes costing $200 or more with a $15 sales tax. But if legislators were serious about solving transportation issues, those buyers should get a rebate instead. 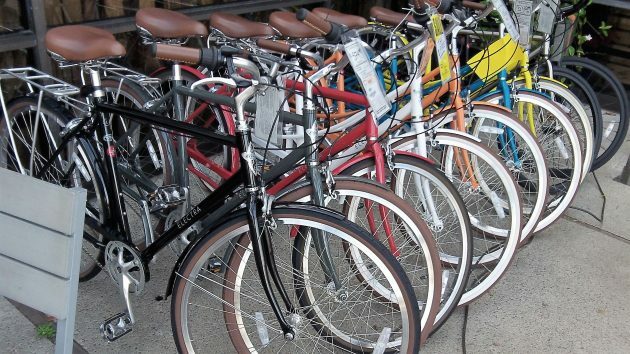 The bike tax would be added to the purchase price and would be a liability of the buyer. It would apply to bikes with wheels of 26 inches in diameter and larger. That covers mountain, road and fitness bikes used mostly by adults. Elsewhere in the bill, lawmakers want to grant rebates for the purchase of certain vehicles. Buyers of electric cars would get $2,500, those of hybrids $1,500. Our main traffic problem is congestion. And how this helps is hard to see. Dan Meek of the Oregon Progressive Party in Portland has a more sensible idea. He urged lawmakers to pass rebates for smaller electric and human-powered vehicles such as electric bicycles and tricycles. The road bill has useful provisions about building more bike commuter routes such as trails. And a bike tax to help pay for them would at least shut up those who mistakenly say bikes don’t pay their way. These shiny Electras, however, would be taxed if they were for sale in Oregon instead of Costa Mesa, Calif.
Hasso, fueled by his love affair with all things bicycle, provides us with the quote below in an attempt to distract the electorate from the reality that bicycles use and consume valuable resources on public roads just like cars. Of course, Hering’s bicycling Sacred Cow is disguised in an unsubstantiated quote from a fellow enthusiast of the two-wheeled kind. One wonders how many “thousands of large vehicles” would be taken off the road were bicycles only given the same tax advantages granted to Prius and Leaf autos. One questions how many thousand bikes would be on the road in a January rain storm blowing in off the coast. Additionally, one questions whether or not $15 is enough of a road tax on bicycles. Pedal pushers spend upwards of several hundreds on their vehicles of choice. Many spend even more. Bikes are not inexpensive. The addition of a $15 licensing fee on top of a $600-dollar French-built 15-speed bicycle hardly seems punitive. The cost of maintaining bicycle lanes alone requires more than that, one suspects. In short, Mr. Hering’s sacred cows are just as important to him as other’s golden calfs are to them. The problem is that Sacred Cows really aren’t sacred, with the possible exception of the the bovines living in India. Maybe what he is trying to get across is that bikes do far less damage to the road and use far fewer natural resources to operate. Maybe what we should do is add a sales tax to anyone buying a car, since their 4000-pound vehicle will destroy roads faster than a 20 lb bicycle. John, with respect I hardly think bikes are the problem when it comes to consuming resources on the road. How about a $30 tax on chains? Maybe a sizeable annual tax on studded tires. I do agree that Mother Nature will probably trump any incentives to move more folks to bikes during our wet months. You’re missing the point. Like most “regulations,” it’s simply a money-raising scheme. The legislators don’t care at this point about things like traffic congestion or the environment. The simply want to raise more tax money so they can balance the budget. I hope the voters take note of this and roll it back. 1. Anybody that buys a “$600-dollar French-built 15-speed bicycle” is beyond help. Just where would you buy one anyway? 2. Poor people don’t buy electric cars, so any rebates are just helping the rich on the backs of the rest. 3. Who is Dan Meek of the Oregon Progressive Party in Portland? Doesn’t sound like anybody to be concerned about.